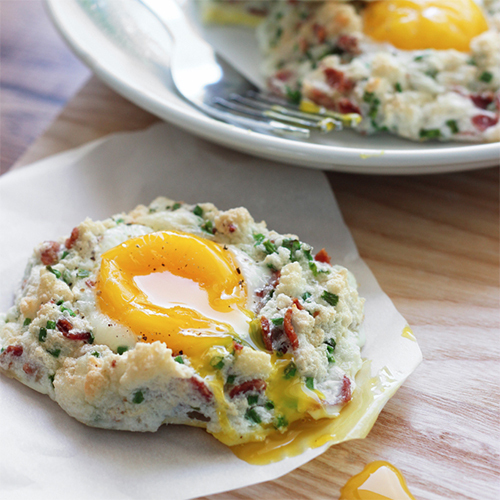 Serve with a side of fresh spinach and extra bacon (if mum is felling in the mood!) You can also top with hollandaise or serve on the side. In a small saucepan over medium-high heat, cook mashing berries until sauce is thickened, 8–10 minutes. Transfer to a bowl. Wipe pan clean, simmer half the cranberries, the vinegars, mustard, and brown sugar until cranberries soften and vinegars are reduced by half, 8–10 minutes. Let cool slightly and transfer to a blender. Add remaining salt and the lemon juice and purée until smooth. With the motor running, drizzle in oil until emulsified set vinaigrette aside. Heat oil in a saucepan or deep fryer to 180c Working in 2 batches, fry frozen Camembert until golden brown and crisp, 2–3 minutes. Using a slotted spoon, transfer cheese to paper towels to drain. To serve, spread some of the reserved raspberry reduction and vinaigrette on a serving plate; arrange ham and rockmelon. 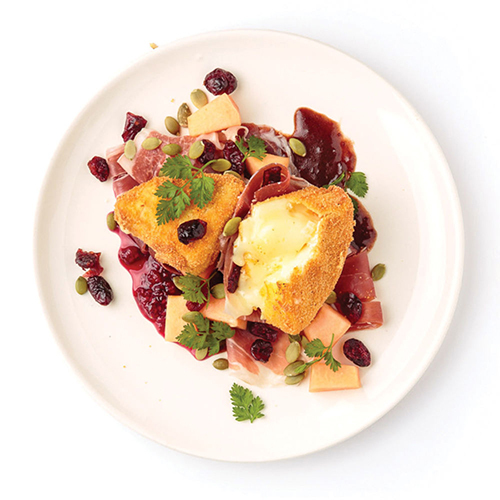 Top with fried cheese; garnish with remaining cranberries, the pumpkin seeds, and parsley leaves. Serve with toasted baguette on the side.